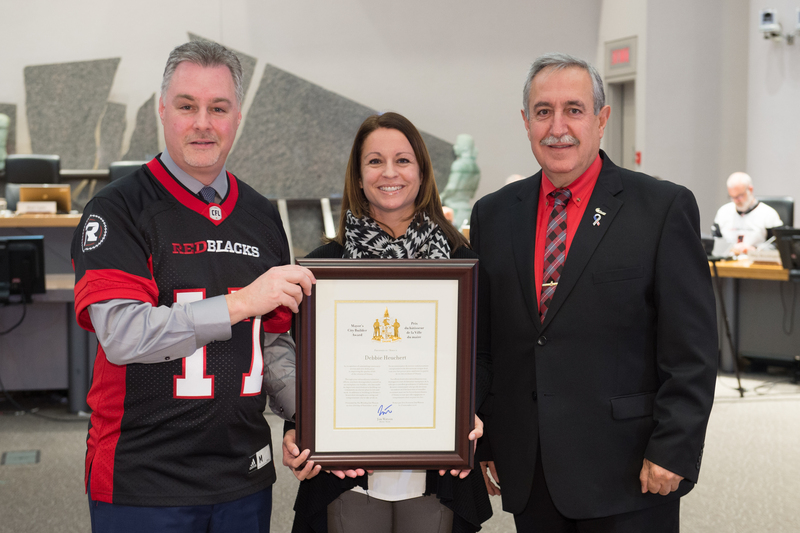 November 23, 2016 – Deputy Mayor Mark Taylor and West Carleton-March Ward Councillor Eli El-Chantiry presented the Mayor’s City Builder Award to Debbie Heuchert at today’s City Council meeting. Debbie volunteers in many areas of the community including coaching recreational soccer and helping to manage the Starlight Synchronized Skating Team. She sits on the executive boards of the West Carleton Minor Hockey Association and the West Carleton Skating Club where she takes on responsibilities above and beyond her duties. Such tasks include organizing team photos and apparel, extra training for program assistants, and helping on various committees within the organizations. For any special event like an ice show, test day, or tournament she is an invaluable asset in making sure things run smoothly. Debbie also volunteers much of her time with Huntley Centennial Public School. She organizes the Hot Lunch and Milk program, assists with the Back to School BBQ, and organizes the Christmas Bazaar, just to name a few. Debbie is a fantastic baker and will spend countless hours in the kitchen making treats for fundraisers or special events throughout the year. Debbie demonstrates values that exemplify selfless generosity, support and extraordinary commitment to making our small community of Carp a better place to live, especially for our children.